Natural predators: Other anacondas (see below) and caimans and jaguars when anacondas are young or small adults. Life span in the wild: Unknown but more than 13 years. Natural habitat: Swamps, marshes and slow-moving streams in the Amazon and Orinoco basins. Green Anacondas belong to the Boa family, a family of non-venomous snakes found in various areas of the world. Anacondas are only found in tropical South America. 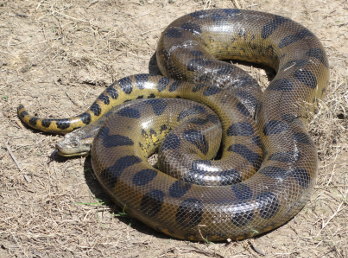 One scientific study found a Green Anaconda that weighed 97.5 kg (215 lb.). Unconfirmed reports exist of a specimen that weighed 227 kg (550 lb.). Female anacondas are known to be cannibalistic and eat mating partners, possibly to help survive the seven months pregnant females do not eat after mating. Females are much heavier than males (normally nearly 5 times heavier) and also longer. This “sexual size dimorphism” (physical difference between sexes) is one of the greatest for any species in the world. 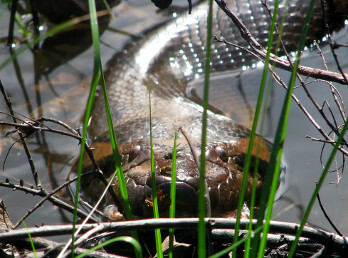 Green Anacondas are polyandrous – females take various partners at the same time. They are known to mate in “breeding balls” – where one to 13 males (on average, four) coil around a female to try to mate with her. Breeding balls last around 14 days but have been known to last up to 40. Sometimes males mistake other larger males as being the female during the breeding balls and attempt to mate with them. Green anacondas can detect approaching animals by sensing their vibrations. They can also detect the chemical signatures of prey (and female anacondas in the mating season) with their forked tongues and “Jacobson’s organs” (in the roof of their mouths). They also have organs along the upper lip to detect heat signals. They can see and hear too but these senses are poorly developed. After birth, baby snakes are given no parental care and are known to be able to swim and hunt small prey almost immediately.